This is a Black Label, 4 Leaf Balsamic Vinegar. This thick, syrupy, balsamic is delicious! This has a much thicker consistency than other 4 Leaf Balsamic Vinegars that I have tested. Here is where you see the ingredients shift with the grape must being in greater quantity than the wine vinegar. This Balsamic Vinegar also has no caramel coloring added. The taste is very fruity and this would go very nicely over fruit and ice cream. This will also make a delicious Caprese Salad! Size – 3.38 fl. oz. Suggested Uses – Suggested for exclusive recipies, fresh fruits, ice creams, drizzled over parmesan. 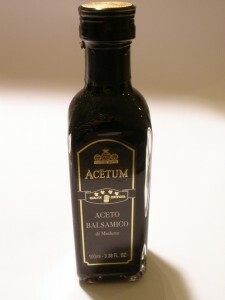 I bought some of the gold label acetum-aceto balsamico di modena while at Little Italy in NYC….love it, but cannot find it where I live. Could you please tell me a site that I could order this from the internet? Thanks! You could try Amazon.com, they have a variety of gold label balsamic’s. You can now access amazon.com right through our site! Thanks!